Less than 20 years ago at a photo shoot, Iman needed to mix her own foundation because none matched the supermodel’s deep hue and tone. Today, women and men of color are seen increasingly in fashion magazines, appear regularly on film and television, and have an improved selection of cosmetics from which to choose. However, given the wider range of hues now available in makeup, finding that perfect shade at the department store counter, in the drugstore, or online can still be a challenge. I think of skin color (or hue) along a spectrum: extremely fair complexions on one end, extremely deep on the other, and many in between. For purposes of this article, let us envision ‘dancers of color’ as women and men whose complexions occupy a deeper range of hues on the spectrum. Regardless of your hue, however, understanding your undertone is the key to selecting and applying makeup that will produce glowing, natural looking results. Tone is the most basic, underlying pigment in any hue. When referring to the skin, there are essentially two tones: red and yellow. Any complexion will have a dominant, equal, or mixed skin tone. Further, while it is often the case, it is not always the case that a deep complexion will automatically have a yellow undertone or that a fair complexion will have red. Fair, medium, and deep complexions can have red, yellow, or mixed undertone. Click on any of the six photos below to see it in more detail. Lotus Niraja and Dellaneira both have yellow undertone. Mia Naja has some red undertone. Marissa has a little of both. While comparatively fair, Malena has a yellow undertone. I also have a yellow undertone, but in the winter I tend to have a redder undertone. There are other designations for one’s skin tone, such as ‘warm’ or ‘cool’, the former often referring to yellow undertone and the latter to red (or sometimes blue). The concept of “seasons” is also employed by professionals and consumers to help determine the most appropriate color matches based on someone’s hair, skin, and eye color. Whether you are a ‘winter’, ‘spring’, ‘summer’, or ‘fall’ will determine the color palette that looks best on you. I prefer to use objective criteria for determining skin tone and color matches, by training my eyes to see color. If you know your skin’s undertone and how to look for the underlying tone in any makeup product, you will no longer have to rely on arbitrary categories or marketing jargon to find your complementary color palette. Hold a plain white sheet of paper next to your face and see what tone(s) are apparent. Remember that you may have both tones on different parts of the face or body. Apply a bright pink and then a bright orange cheek or lip color one at a time and see which color complements you. If it is pink, then you have a red undertone; if it is orange, then you have a yellow undertone. In front of a mirror, put on a bright white shirt and then a cream-colored shirt. Which shirt washes you out, makes you look tired and drained? Which one is uplifting and flattering? If you look best in the cream shirt, then you have a yellow undertone; if the bright white shirt looks best on you, then you have a red undertone. Does silver or gold jewelry look best on you? If silver, then you have a red undertone; if gold, then you have a yellow undertone. Foundation: Match your skin tone(s). For accuracy, test at your chest, neck, and jaw with several shades. The correct color foundation should disappear. Concealer: Match your skin tone(s), unless you are color correcting (see below, “Color Theory”). Cheek color: Match your skin tone(s). Lip color: Match your skin tone(s). If you have more than one skin tone, your color options are considerably expanded, but you may be required to use two tones of foundation. I also recommend color correcting first, then applying foundation, then concealer, if needed. You may find that little to no concealer is needed after color correcting. Blue / Orange. "Howard Johnson"
NEXT TO each other, they become more VIVID. COMBINED, they NEUTRALIZE each other. 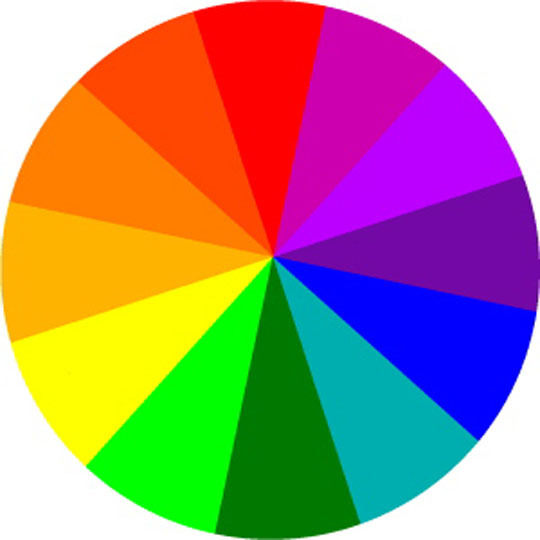 Click on the color wheel to the right to see it in more detail. 1) You have slight redness around the hairline. Nacara has a pressed powder compact that is great for reducing redness. The powder has a slight hue of what color? 2) Your eyes are amber brown. What shades of eye makeup should you apply to make them appear a more translucent, orangey brown? 3) You have dark, blue-purple circles under your eyes. What tone of concealer will neutralize them? 4) You stayed out late last night and awoke with blood shot eyes. Your photo shoot is at 9am. What color eye shadow should you avoid? 5) You have light mocha hued skin and a black tattoo. What is a good way to hide it? a. Apply a green-toned concealer over it and then cover with orange hued foundation. b. Apply a red-toned foundation over it and then cover with a yellow-toned concealer. c. Apply a red toned concealer only. d. Apply an orange-toned concealer and then cover with creamy brown. 1) c. Green cancels red. 2) b. Amber brown contains orange. Dark colors that contain blue will draw out the orange. 3) d. A combination of orange and yellow will help neutralize blue and purple, respectively. 4) a. Green against red will cause the red to stand out. 5) d. Black tattoos tend to carry a blue tone, especially on deeper complexions. Orange concealer will neutralize the black ink, and covering with a creamy brown (like the color of mocha) will even out the hue. I have worked with models who possess very deep, gorgeous hues in their skin. Either through misinformation, bad lighting, or other reasons, they wore the wrong color foundation, which made them look tired, gray, and did not match the rest of the body. Many deep, golden-toned complexions will look ashy as a result of foundation that is an incorrect tone and is simply not deep enough. Bobbi Brown and Iman offer yellow toned foundation, concealer, and powder to accommodate deep hues, as does MAC and Nacara, which offer many yellow and red toned products. Once you have trained your eyes to look for tones in cosmetics, you will be able to see subtle differences in any hue and pick the right brands for you. If it is difficult to see tone in a product, dab a little on a piece of white paper. Many deep complexions have both yellow and red tones on different parts of the face. Yellow-toned areas tend to be the “highlight” areas: bridge of the nose, the fleshy parts of the cheeks under the eyes and the cheekbones, forehead, upper lip, and ball of the chin. The more recessed areas, such as around the hairline and jaw may contain red. It might be necessary to purchase two tones of foundation, concealer, or powder to accommodate these areas to prevent an ashy and “flat” appearance. Take a close look at the tone in your under eye circles. If it is difficult to determine, hold a piece of white paper or handkerchief underneath them. Do they appear purple, blue, or both? Many concealers have a yellow undertone to neutralize purple. If your under eye circles contain blue, however, yellow will make them look what color? YELLOW + BLUE = GREEN. Prevent ashy under eye circles by using a concealer that contains orange to neutralize blue. Orange concealers may not be common in drugstore or even some department store brands. You can mix your own color corrective concealer by adding a miniscule amount of orange hue foundation, cream eye color, cream cheek color, or even lipstick to your existing concealer or foundation, as long as it does not contain any shimmer. Just because it is labeled “lipstick” or “foundation” does not mean you cannot mix it. When you strip away the labels, makeup is just creams, powders, and liquids. (Michael DeVellis, The Powder Group). Knowing this will expand your custom blending options significantly and save you money. This blend can also be used to highlight and brighten the face. A word of caution: when you add orange, be sure that it is yellow-orange, not red-orange because RED + BLUE = PURPLE. Thus, if your under eye circles contain blue, adding an orange concealer that contains too much red will enhance the blue-purple hue. People with fair to medium complexions normally select blush or contour color that is one to several shades darker, or simply use a bronzer to sculpt the face. For those with deep complexions, deeper colors tend to look muddy or bruised, if apparent at all. I would recommend using a bright lilac (for red skin tone) or bright orange (for yellow skin tone) cream or powder blush to highlight the face, instead of applying a darker hue to contour. You will, in effect, sculpt and add dimension by highlighting with these hues (which will not appear as bright as they sound), while adding a vibrant glow to the highlight areas. Using the proper colors and tones of makeup becomes more critical for onstage performance and photo shoots. Bright stage and studio lights will illuminate wrong tones of concealer and mismatched foundation, as well as apparent redness and dark under eye circles. Without a makeup artist on hand, it behooves you to be knowledgeable about what makeup will help you look your best. Your skin tone may change over time due to hormones, genes, or sun exposure. As an example, several months after I had moved from a temperate climate to a harsher, colder climate, I discovered that the mineral foundation I had used for years was no longer the right color. Once I adjusted the color of my foundation, it highlighted how my old concealer made my under eye circles look ashy! While the base tone is still yellow, my foundation now has a touch of red in it and my concealer has a slightly orange hue. When you find the right colors for you, you appear more vibrant and healthy. Celebrate your unique place on the spectrum of hues with colors that complement and enliven your personality. I hope that opening your eyes to the right color of makeup becomes a journey of discovery, rather than a chore. Each application is a learning experience. If it turns out great, take a photo to document what worked. If not, it all washes off and you can start again to help bring out your inner beauty. Color Levels: Teeth and Skin. By Saqra. Christine Millan (known in the dance world as Azhia) is a freelance makeup artist based in Montréal, Canada. Her experience in the industry has enabled her to work all over, including San Francisco, Toronto, New York City, Philadelphia, Chicago, Portland, and Baltimore. For more information about Synthetic Shadows, see www.syntheticshadows.com . For more information about Frank Wu, see www.fanphotodesign.com .